The title of the movie is “Pirates of the Caribbean: Dead Men Tell No Tales,” but it could have just as easily been called “Pirates of the Caribbean: Dead Franchises Tell No Interesting Stories.” I have seen five of these movies in the last fifteen years of my life, and they have neither gotten fresher nor more fun. They exist in a vacuum of itself where the world of the characters either takes itself too seriously for its own good, or everything is whimsical while not making sense for all the wrong reasons. I suppose I should be thankful that the movie is directed by Joachim Rønning and Espen Sandberg, whose previous movie was “Kon-Tiki,” an Oscar-nominated adventure film about men who braved the open seas of the Kon-Tiki expedition. This is the sort of credential that likely gave Disney the confidence to hire them for the next installment of their multi-million franchise. This is not a movie Oscar-nominated directors should have to follow up with after a successful debut, but I admit it is a big opportunity to have Disney knocking on your door, and I want to give them credit because the action sequences are more fun and lively this time around. 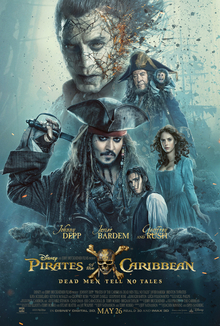 In fact (dare I say it) “Pirates of the Caribbean: Dead Men Tell No Tales” is easily the most fun I’ve had with this series in a LONG time! It doesn’t take itself nearly as seriously as the past three films have, and at only slightly over two hours, it is by far the shortest (which is a good thing in my book). And what do you know: There’s a good old-fashioned treasure hunt this time around! One that begins shortly after a botched bank robbery by Captain Jack Sparrow (Johnny Depp), whose hippie infused performance has been getting really annoying over the years, but seems to have come full circle to being at least partially charming once again. He has become the anchor for this series, which has largely dispatched of old cast members (outside of cameos) while bringing in new ones. The key player this time around is Henry Turner (Brenton Thwaites), who is the son of Will Turner (Orlando Bloom). He has spent years trying to find the Devil’s Triangle, which, if found, may be able to break his father’s curse of sever seaweed acne. The search has resulted in bringing the evil Captain Armando Salazar (Javier Bardem) back from Hell so he can roam the Earth once more, and this is a man who (surprise, surprise) wants to find Jack and kill him (for someone who is so endearing to audiences its sort of amazing almost no one in the movies themselves seem to like the guy). Also, Captain Barbosa (Geoffrey Rush) is walking around. I was never entirely sure why, but if you have an Oscar-winning actor under contract you might as well use him, right? All of this is an excuse to sail the seven seas, get into epic sword fights, and battle with walking dead people who can never be killed (which means our heroes are essentially going to fight until they tire and get stabbed). Also, there is the obligatory female character who exists largely for Henry to have a love interest. I do admit to finding some humor in the fact that people believe she is a witch because she is a gifted scientist in a time when women were expected to clean socks and birth children, but the movie still isn’t able to stretch the joke effectively for over two hours. If the idea of this character was to appeal to feminists I will be VERY curious to see what their reaction to her is! 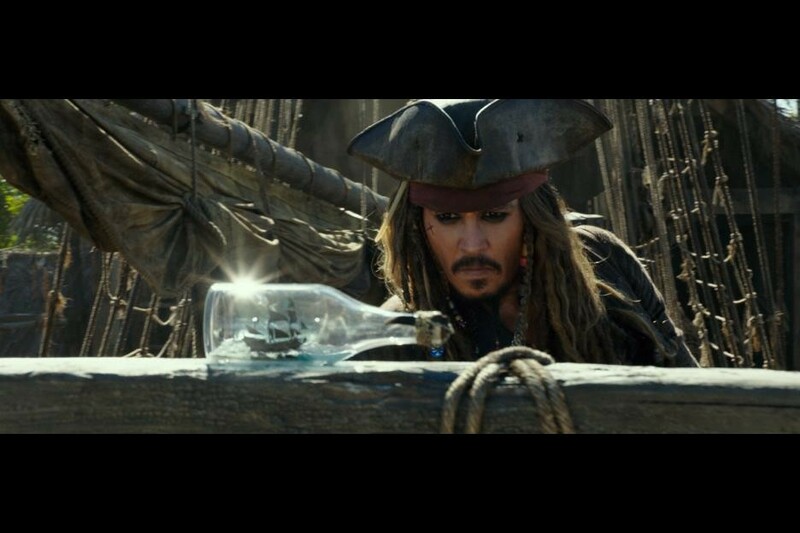 Aside from that…I expect most people will react to “Pirates of the Caribbean: Dead Men Tell No Tales” much in the same way they have reacted to previous installments. This one is a little more fun and lighthearted (which is certainly a step in the right direction), but it is still stupid in some very wrong ways. The way characters don’t have chemistry becomes a problem. The fact that the only way to kill the villains is to break their curse is becoming tiring at this point. The pirates always backstabbing each other is a maddening way to delay the story moving forward, and I keep hoping in vein that trust can come around so that things can progress a little faster. In the future, I would prefer to see these movies continue down the path of fun, adventure, and maybe clock in at less than two hours. At that point, you might not have a great movie, but you would have one that is fun, spirited, and has a bit with a monkey in it. Parents, there is the usual amount of pirate action and violence, along with some minor language, booze drinking, and dead people walking around. Recommended for ages 13 and up.